From the event files. 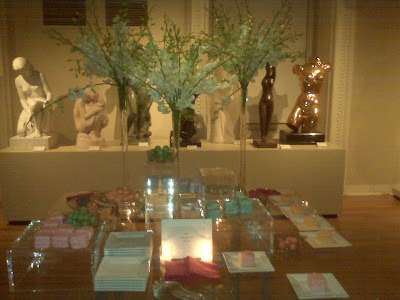 Sometimes I have a very difficult job that mandates me to go to events at fabulous venues like the National Portrait Gallery and eat little colored cakes and yummy macaroons. I know, it's a hard existence. Last night I braved sideways stares and minimal shame and snapped this picture on my phone of the beautiful dessert table by Susan Gage Caterers. Want a noticeable but simple dessert tray option for your next party? No need for fancy french sweets. Milk and cookie shooters are a perfect go to. Store bought or slaved after, everyone loves a little cookie bite and a shot of milk to wash it down. They won't forget it. I've hated milk my whole life but I'll take two cookies instead please. 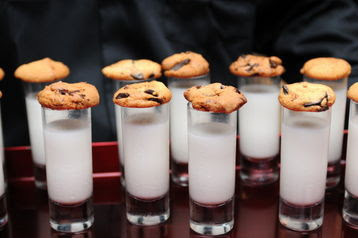 Omg, those milk and cookie shooters are sheer brilliance. Stir Crazy Reading: New Issue of Lonny!